Would you like to maximize the impact you have with your leadership development program? Mindful leadership trainer Matt Tenney, author of the acclaimed mindful leadership book The Mindfulness Edge: How to Rewire Your Brain for Leadership and Personal Excellence Without Adding to Your Schedule, can help your team to quickly improve the most essential leadership skills that have the greatest impact on business outcomes. Matt offers an “out-of-the-box” mindful leadership training program, as well as fully customized programs. In all of the mindful leadership training programs, the focus is on developing the most essential leadership skill: Self-awareness. The programs focus on improving self-awareness because self-awareness is a meta skill: It affects every other aspect of leadership. Thus, a training program that systematically improves self-awareness provides the maximum impact on business outcomes with the least amount of resources invested in leadership development. 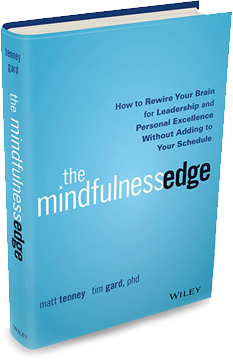 To learn more about our mindful leadership training programs, please click here. He began his mindfulness practice in 2002 under rather extreme circumstances. In January of 2001, Matt attempted a fraud against the US government. Although, he voluntarily abandoned the attempt before any harm was done, he had taken enough steps to be found guilty of attempted fraud and ended spending five and one-half years confined to prison. In 2002, Matt was introduced to mindfulness training and began training very diligently. Within six months of starting the practice, Matt was practicing mindfulness during nearly every waking moment of the day. It was at that point that Matt realized he was happier in prison, with nothing, then he had ever been in his life. He had discovered unconditional happiness. Matt had been learning about the practice through the teaching of several monks. Since everything he had learned had worked so well and created such amazing results, Matt decided to spend the rest of his time in confinement living and training exactly as monks live and train. He followed all of the rules of monastics, gave up all entertainment, and spent hours every day engaged in sitting and walking mindfulness practice, in addition to the moment-to-moment practice during all daily activities. As a result of the training, Matt not only discovered unconditional happiness. He also realized that the most meaningful life is one devoted to helping others. This devotion to helping others has been Matt’s focus ever since. He spent a lot of time helping inmates and guards to train their minds to be happier and more at peace. After leaving confinement in 2006, Matt lived and trained in a monastery, and almost ordained to become a monk for the rest of his life. However, he realized he could be of greater service to others if he trained as a monk “incognito” while living like most people do. As many people do who want to change the world, Matt co-founded and led a non-profit that offered mindfulness training to underprivileged youth and former inmates. This led to being invited to co-found and lead the Gainesville, FL chapter of Kids Kicking Cancer, a non-profit that helps very sick children to be free from suffering by using mindfulness and other tools utilized in the martial arts. Working in the hospital setting led to Matt being invited to conduct mindfulness training for nurses at the University of Florida Health system. Matt’s work grew and grew as he was invited to provide keynotes and mindfulness training for more and more organizations. In 2017, Matt founded a marketing company called The Generous Group, whose mission is to be the best place in the world to work, with a focus on developing kind, compassionate, happy, mindful leaders, and thereby contribute to creating world peace. Matt currently serves as the chief people officer for The Generous Group, so he can empathize with leaders who are in the trenches every day, dealing with the never-ending challenges of being a senior leader in a company. He’s doing those things, too. Thus, because Matt has had years of experience practicing mindfulness very intensively and integrating that practice into his role as a leader, Matt is a mindful leadership trainer who is highly adept at offering extremely practical guidance for practicing mindful leadership, and can also help people to go very deep with their practice.